Dave Ramos edges 2015 National Champion, David Brawner to capture his first North American RC Laser Championship. Ramos, who won last year’s Nationals in his first ever Laser regatta, sailed more consistently than the other 17 skippers. The field consisted of skippers who have won scores of national and international championships. The conditions Saturday were “are we really going to sail in this?” blustery and cold. Two skippers tried C rigs, but quickly abandoned them, joining everyone who donned their D rigs for the remainder of the day. The first day’s results from the even/odd format showed multi-time Laser champ, Jim Kaighin, who traveled from the Bahamas, in first, followed by Jamey Betz, William Bentz, Dave Ramos and David Brawner, all within 11 points of each other. Everyone sailed thirteen races on Sat. The fleet was divided in two with each fleet completing 10 more races. Sunday’s weather also was in the low 60s with NE winds again, this time more moderate. In fact, two skippers tried their A rig but found it a little too ‘uncomfortable’ in the 18 mph puffs. Unfortunately these puffs were occasionally followed by 2 mph lulls making several mark roundings memorable for the spectators. Brawner had a spectacular day on Sunday. His counting races were six bullets and three thirds, easily winning the day. Unfortunately his eleven point deficit starting the day was a little too much to overcome. Ramos had three bullets and finished consistently well to move up from fourth starting the final day. EC12 national champ, Jamey Betz was in contention but slipped just enough to drop to third, seven points ahead of Kaighin who experienced a failed rudder servo among other problems. In the Silver Fleet, Dave Branning dominated. His throwout for the day was his only second, the remaining were all firsts. His less than perfect day one relegated him just two positions below the gold fleet break. Although 23 points behind the leader, Henry De Wolf demonstrated why he was the top Silver Fleet qualifier garnering a second place award. Victor Oberg was the final trophy winner and rebounded well from his ill advised A rig adventure earlier in the day. A complete brand new Laser was donated by Jim Myers, Intensity Sails and all skippers were eligible for the prize. 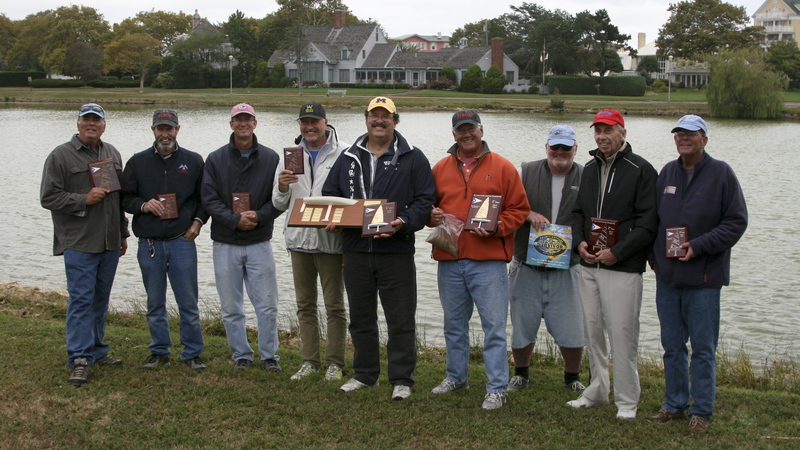 Dave Branning, who had already won the Silver fleet award, and was presented a bag of sand by his fellow competitors, also took home the new Laser. In all my years of competitive sailing I have never seen what the skippers did for Deb Hirschman. She was such an unbelievable help to each and every skipper that they took up a collection and presented her with a very nice thank you gift. She singlehandedly launched and retrieved every boat for all 46 races. BRAVO !! !